This is a ridiculously silly (but still kinda fun) shifter romance. It starts out quite sensibly with an excitable, twinky barista fancying one of his customers, an older college professor. But by the time the author has added a string of action sequences and fights between organised crime hitmen and shifters of every possible species, my head was spinning and I couldn’t keep track of who was doing what to whom. I’m not sure how much of this story is supposed to be taken seriously. Some of the humour is intentional (gotta love the bison shifter named William = Buffalo Bill). Some of the humour came from ridiculous villains using exaggerated dialogue straight from a 1980s TV crime drama. Even more of the humour came from the WTF moments where I tried to figure out what was going on. So many complicated back plots are referenced and not clarified in this story that I was sure I was jumping into the middle of an established series until I rechecked that this is book #1 on Goodreads. There are also some serious moments as Donnie tries to figure out his future and work through his relationship with his family. I’m not sure this works terribly well in a relatively short novel with a whole lot of action and deliberate humour. William remains a mystery through much of this story and even by the end he hadn’t developed much beyond what he told Donnie about himself. Without thinking too hard, this is a fun and exciting read. It won’t stand up to any intense scrutiny but there were some scenes that made me laugh and there really aren’t enough stories about buffalo shifters! 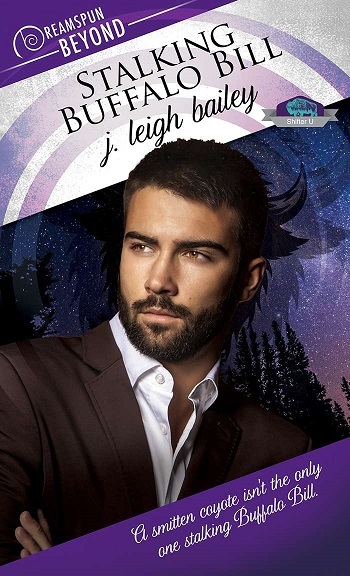 Reviewers on the Wicked Reads Review Team were provided a free copy of Stalking Buffalo Bill (Shifter U #1) by J. Leigh Bailey to read and review. I like dragons a lot. But in general, I like them all, if the shifter is not the common one even better. I like wolf shifters so a coyote shifter sounds fun. I haven't found a type of shifter I don't like, but possums, snakes, and some others are harder to get used to. Dragon shifters are my favorite. I like unusual shifter like Gargoyles and Dragons. I love dragons, but wolves and tigers are awesome too.